Transmitter-toting whimbrels turned heads two years ago when one tagged in Georgia flew through Hurricane Irene, bound for Suriname. The same research project has shown that whimbrels can fly as far as 4,500 miles non-stop. But findings deemed more important, and drawing less notice, are where these declining shorebirds are migrating and what habitats they need for their long-haul flights. 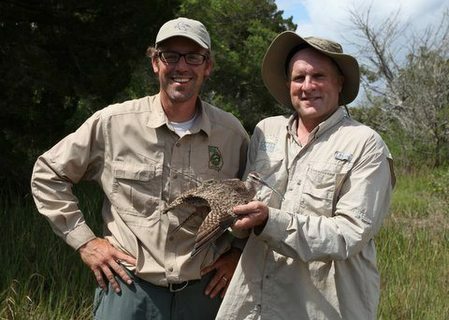 As part of a collaborative effort led by the Center for Conservation Biology, Tim Keyes of the DNR’s Nongame Conservation Section and Brad Winn of Manomet Center for Conservation Sciences recently caught and fitted four whimbrels with tiny transmitters on the Georgia coast. The wildlife biologists also marked the return of a whimbrel named Postel. Keyes and Winn outfitted Postel with a transmitter in May 2012 near Bloody Marsh park on St. Simons Island. The bird then flew north to breed in the Hudson Bay area, south to winter in Brazil and north again, stopping earlier this spring to binge on fiddler crabs in the same St. Simons marsh where researchers caught it last spring. “One of the real highlights of this project is keying in on really critical areas” for whimbrels, Keyes said. In Georgia, those areas also include four roosting sites. Keyes said hundreds to thousands of the birds are gathering each night on Pelican Spit between Little St. Simons and Sea Island, Little Egg Island Bar in the mouth of the Altamaha River, St. Catherines Island Bar and Raccoon Key Bar on the Ogeechee River. The sandbars double as sanctuaries largely free of predators such as raccoons and great-horned owls. Keyes has seen whimbrels winging toward these roosts from as far as 50 miles away in the evening. “As long as food is available, distance doesn’t seem to be a big issue for (whimbrels),” Keyes said. Revealing what Keyes calls the nuts and bolts of whimbrel migration ecology. That includes surprises, like a previously undocumented route reaching from the Mackenzie River in northwest Canada to the Gulf of St. Lawrence, Brazil and then the Gulf of Mexico. Pinpointing nesting, wintering and stopover – or refueling – sites is vital for conserving the species. Raising questions about hunting shorebirds on the Caribbean islands where it remains legal. Two whimbrels with transmitters were shot within 24 hours in 2011, spurring calls for greater awareness and increased regulation. Emphasizing the value of cooperation to conserve whimbrels and other shorebirds. DNR has been involved since 2010, with work funded through a State Wildlife Grant and TERN, the Nongame Conservation Section’s friends group. Yet, he adds, collaboration with partners such as Keyes and Fletcher Smith of the Center for Conservation Biology is not only showing “what the birds need to survive over a vast landscape that stretches from Alaska to the coast of Brazil,” it will benefit other long-distant migrants that depend on the same wetlands used by whimbrels. 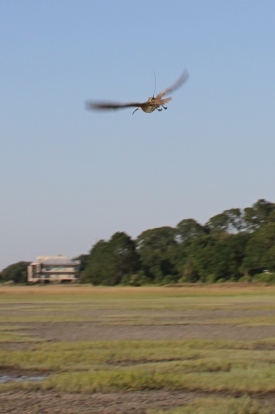 Powered by fiddler crabs – Keyes has seen whimbrels gobble as many as one every 10 seconds – the curve-billed shorebirds will soon leave Georgia. Three of the four newly tagged birds are already gone. And at last check, Postel was closing in on its nesting grounds in southwestern Hudson Bay. It’s an unimaginable trip for most wildlife. For whimbrels, it’s just the next stop on migration. Only whimbrels that weigh at least 400 grams are fitted with transmitters. Each transmitter weighs 9.5 grams, or less than a third of an ounce. That’s less than 3 percent of the whimbrel’s body weight and only slightly heavier than two teaspoons of sugar. The transmitter is placed on the bird’s lower back and attached via a figure-eight harness that allows free range of motion. Tagged birds are mostly named for local water bodies or coastal islands. The four from Georgia this year are Cabretta (Cabretta Island), Mackay (tidal river near St. Simons); Ossabaw (island) and Wolf (Wolf Island National Wildlife Refuge). Postel, in his second year carrying a transmitter, is named for Postel Creek on St. Simons. This week, Cabretta was over the Great Lakes, Mackay was near Hudson Bay and Ossabaw had crossed Michigan. Wolf was still on the Georgia coast. DNR’s Bird Island Rule, which became regulation in 1998, protects critical nesting sites such as sandbar islands for seabirds and shorebirds, as well as migration and wintering refugia. Waterbird conservation updates in Nongame Conservation's annual report. DNR bat biologist Trina Morris had plenty of response last year when she asked for volunteers to help record bat calls across the state. She also had a problem. Atlanta had willing volunteers but no routes because the survey requires driving on relatively straight roads at 20 mph after dark – a tough combination to find in the metro area. But Trina wondered, why not run a route on the water, like some other states do? And why not on Atlanta’s main waterway, the Chattahoochee River? Encouraged by a bat volunteer, she contacted staff at the Chattahoochee River National Recreation Area. And on a cool night this month, Trina and National Park Service biologist Allyson Read and officer Sean Perchalski were motoring upriver from Medlock Bridge, dodging snags and recording bats. 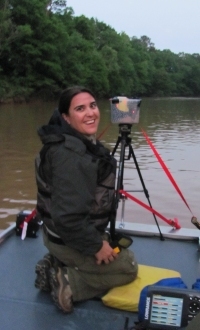 Read Trina’s blog post about recording bats on the 'Hooch, including the encouraging results! New research shows how being entangled in fishing gear hindered one North Atlantic right whale’s ability to swim and dive, eventually causing its death. 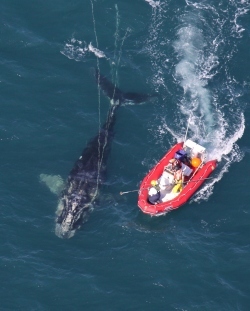 The study, led by Woods Hole Oceanographic Institution and including DNR biologist Clay George and others, attached a monitoring device to an entangled right whale. After being freed (video), the 2-year-old female swam faster and dove longer and twice as deep. The whale died about a month later from chronic effects of entanglement. Sea turtle nesting season is in full swing. After the first loggerhead nest was found on Wassaw Island the night of May 13, the Georgia Sea Turtle Cooperative has logged more than 180 nests. Updates. Sea turtle strandings in Georgia topped 72 as of May 25. Though fewer than 2012 or 2011, the total is higher than during the same time the previous three years. With boat strikes a leading cause of sea turtle deaths and injuries, boaters are urged to keep watch for these rare reptiles. Updates. Two pathogens threatening amphibians haven’t sapped stream salamander occupancy rates in the upper Tallulah River watershed, according to a study funded by State Wildlife Grants (abstract). Researchers led by Archbold Biological Station’s Betsie Rothermel found only two of 101 salamanders sampled infected with chytrid fungus, and while 30.4 percent had ranavirus, the probable occupancy of salamanders still ran high. Many species carry the pathogens without developing associated diseases, leaving researchers to think the targeted salamanders are less susceptible. On the law enforcement beat, DNR Ranger 1st Class Joe Hill cited a Gilmer County person with possession of protected birds after sheriff's deputies discovered the subject had a mounted hawk and owl. In Appling County, Cpl. Chase Altman found workers at a blueberry farm shooting at cedar waxwings to keep them from eating the berries. Altman warned the farm owner that the songbirds are federally protected and advised him about possibly getting a crop depredation permit. See weekly reports. The Atlanta falcons live-streamed by DNR have fledged. 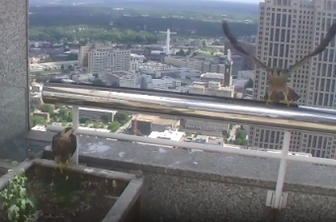 The two young peregrines left their SunTrust Plaza balcony home last week. At least one has since been spotted, flying by a nearby office. Watch video of a fledgling testing her nerve and one making what may be her first flight. The Go Fish Education Center in Perry is the focus of a new video on the Sportsman Channel. Check it out! A Farm Bill rewrite could be in place before Congress takes its August recess. The legislation -- there are House and Senate versions – features plenty of implications for wildlife and land conservation programs, as noted by organizations such as the National Wildlife Federation. Burmese python records are made to be broken, too. A Miami man recently caught and killed an 18-foot, 8-inch python crossing a rural south Florida road at night, beating the state’s previous best for the invasive snakes by a foot. Correction: Brahminy blind snakes have rudimentary eyes that likely can register light intensity. A story in the May 14 Georgia Wild (“Blind snake worms way onto coast”) incorrectly described the non-native species’ ability to see. Also, Brahminy blind snakes burrow in leaf litter as well as in the soil. "Sea turtle nesting season off to slow start in Georgia, neighboring states," SaportaReport. Other coverage via AP. The Nongame Conservation Section of Georgia DNR receives no state funds to conserve nongame wildlife, native plants and natural habitats. Instead, we depend on contributions, grants and fundraisers, such as the eagle and hummingbird license plates. nongame wildlife. Nongame includes wildlife not legally fished for or hunted, plus native plants and natural habitats. Georgia Wild copyright © 2013. Wildlife Resources Division Nongame Conservation Section. All rights reserved.